Printed from http://www.bodytalksystem.com//learn/news/article.cfm?id=836 on Apr 22, 2019. 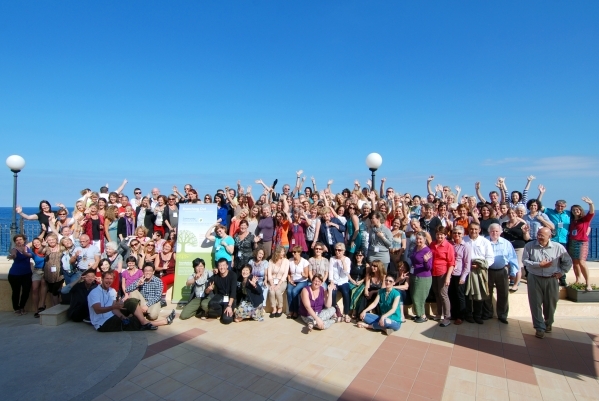 Many of us have experienced the exhilarating feeling of a reconnected birth vivaxis and because Malta was the birth place of BodyTalk, that is just what we got. If you haven't had the pleasure of this experience then wait for it...the ripple is making its way through the matrix! The Members Conference was a nice ebb and flow of information oscillating between science and philosophy. Although John joked several times throughout the conference about becoming less and less important, he did have the honor of a 'Knighting' ceremony to kick off the fun. Dr. Manjir Samanta-Laughton was an absolute pleasure to listen to. Right off the hop she struck me with words I will never forget; she said that someone can intellectually understand a concept or new idea but they are not always emotionally ready for it to become part of their reality. As BodyTalkers, I think we see this a lot with our clients and possibly even with our family and friends. You know, in that moment when you and your client have come to a deep understanding about something...had an ah-ha moment, or a spontaneous insight yet the client is unable to carry it with them into their reality. It helps to remember that and know that it is also okay. This can even be valuable to remember for ourselves; when we experience a profound shift, yet still can't seem to get out of the same old habits. Then, in a very eloquent way, she lectured on the perception horizon, black holes, electrons, positrons, time, space, and light. Essentially she gave the scientific equivalent to the concept of enlightenment. So many pieces came together for me. It was a true meeting of science and philosophy. Next we were inspired by Matthew Newell who managed to bring a few tears to our eyes with his touching perspective on what, for some parents, is a knife to the heart; neurological disorders in infants and kids. What a refreshing outlook he has. The Family Hope Center truly encompasses the Whole family when it comes to healing the brain. He gave us key pieces of information that every parent and Practitioner should know including things like: olfactory stimulation is imperative when it comes to early brain development, AND "don't blink...no fear!" Then it was time for the members to hear from our CEO, Chris Veltheim who hit a nerve for many of us when he talked about the discomfort experienced when someone asks, "what do you do?" Chris's perseverance in finding an accurate and useable answer to this question has paid off. His new branding, WholeHealthcare, perfectly embodies the heart of what we do. He also gave the members a glimpse into PaRama Campus, an online platform for Educating Open Minds (love it). It is clear that Chris's attention to detail combined with his creativity will be a major asset to the expansion and sustainability of BodyTalk. Chris was followed up with Melanie Buzek who dished out a little love to all those who have contributed to the forward movement of BodyTalk. Mel also gave us the low down on the IBF and the Outreacher Program that was launched early this year by Dorothy Friesen. As part of this program these Outreachers traveled to a typhoon devastated region on the southern island of Mindanao to offer Access where over 200 people learned the techniques. Pretty cool. Then we changed gears a bit and turned to a more serious topic that, as we become more mainstream, will be something we will have to become more familiar with. Wilma Grobbelaar and Dale Fox gave an informative and thoughtful presentation on the various facets of dealing with clients who are battling cancer. And because we always just ask for the priority and follow the protocol, it may seem pretty straightforward when it comes to working with someone who has cancer. However, this is not necessarily the case. Educating yourself at a basic level on some of the factors involved in this imbalance will help to clarify the quality of your questions when asking innate for the priority. The last day of the conference, once again, took it to the next level. Prof. Michael Zammit opened the day with a moving presentation that took me by surprise. Speaking Sanskrit, he used his powerful, resonating voice to give us deeper meaning to the origin of words. I am pretty sure he left a few people in the audience vibrating for days. Then Dr Laura Stuve gave a brilliant talk on DNA and Epigenetics. She used a simple and effective analogy to explain a very complex topic, not an easily accomplished feat. She also gave us clear and direct practical application of this topic at every level from Fundamentals to PaRama BodyTalk. She shed some light on the infamous Cellular Repair technique and introduced a welcomed change to protocol when dealing with acquired and inherited conditions. Instead of finding a disease or illness as the priority, we are shifting to looking for an Organ, Endocrine, or Body Part as the focus for the balancing. What a relief, this simple change makes a significant shift in our approach to this technique. And to close the conference, John gave us some of his insights and 'take-a-ways' from the series of awesome presenters from the 3 days. As usual, he helped us take great information and apply it in a practical way. A big thank-you to Claudia and Felix for making it possible to really experience Malta. Every part of the conference was so well put together; the hotel, the meet and greet, the party, the sightseeing. You went above and beyond to make it memorable. And lastly a shout out to the IBA team, well done! Very grateful for all your hard work. Looking forward to some Canadian fun in 2015! The Instructors meeting was a refreshing mix of business and heart energy. The meeting kicked off with an exercise in speaking from the heart, something I would describe as intimate and experiential...and not as easy as I thought it would be. It takes a deeper level of focus to really listen to someone without trying to fix them or solve anything. Interestingly enough it was presented by Gilly Adkins who was skyped into the meeting right from the comfort of her home. A good sign we are breaking through our limitations around connecting from afar. Next up was our feminine martix holder and president Claudia who gave an inspiring talk on the Dharmic Instructor. There were several gems in her presentation; all excellent reminders of our common goal to uphold, support, and maintain ourselves, our lives, and our work. She left us with these words from Rumi: "Your task is not to seek for love, but merely to seek and find all the barriers within yourself that you have built against it." Next we heard from Karla Kadlec who dazzled us with her savvy business skills that, for me, boiled down to one simple message; is your heart in it? When you give a public talk would you want to sit and listen to you? When you talk to your clients, are you there? The amount of YOU in your work, speaks volumes. Then it was time for a lesson in business with Jeffrey Goodman. Again, this was packed full of great information but a key take away was his perspective on different learning styles. To be able to understand and recognize the nuances of our students learning styles is invaluable. We were then gently reminded by Yoriko Ogura and her team just how important BodyTalk Access is. It is our front line and the gateway to the entirety of this wonderful system. The Access courses are our opportunity to show people how 'Whole' this system is. Imagine how your life would be different if you did not have BodyTalk in your life? When we hold back and do not give our Access students a glimpse of the big picture then we are depriving them of what will likely be a life-changing journey. This was followed up with our CEO, Chris Veltheim who gave us a live demonstration of what is to become the future of BodyTalk. As an Instructor, one of the hardest things to see in class is when the students hit the wall with information overload. Chris's vision of what he is calling PaRama Campus will remedy this all too familiar experience. The possibility that a student can come to the Fundamentals class and already have reviewed the content online before the course excites me. It will allow me to focus on the experiential parts of the course and really give the students the space to make the leap. Melanie Buzek took us down memory lane and gave us a snap shot of how far we have come in the last two years. Time flies and it is easy to forget where we started. She also gave us a few important updates that have occurred at the Fundamentals level...so be sure to update yourself. Lastly, Angela Adkins took us on a three-part journey across the US, giving us her experience in working with coordinators and local matrices as a traveling Instructor. Of course, the Instructors meeting would not be complete without a matrix session and a little MindScape.